Douala Athletic Club, often referred to as DAC, is one of the newly promoted clubs in the Cameroonian MTN Elite One 2013. After three rounds, DAC is number three at the table with five points. From my point of view, teenage striker Richard Njoh Edimo is the player to watch at DAC. Njoh Edimo has already scored two goals in three matches, his first goals at top level of Cameroonian football. My first record of Njoh Edimo is from June 2010 when he was named in the squad of the Cameroon U-17 national football team. At the time, Njoh Edimo was playing for amateur club Daga Young Stars from Douala. Njoh Edimo kept his place in the Cameroon U-17 squad throughout 2010 and 2011. 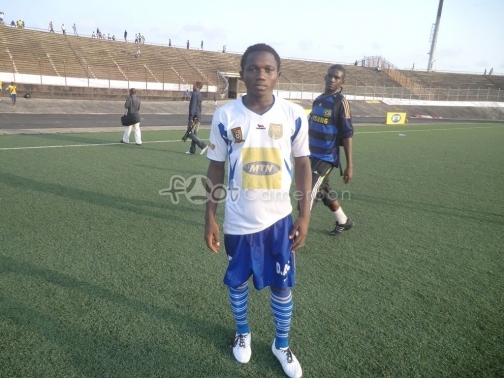 In November 2011, Njoh Edimo was still at Daga Young Stars and still part of Cameroon U-17. As far as I know, Njoh Edimo joined DAC in late 2011 or early 2012. Njoh Edimo scored regularly throughout the MTN Elite Two 2012, the second level of Cameroonian football. In April 2012, Njoh Edimo was promoted from Cameroon U-17 to the Cameroon U-20 national football team. Njoh Edimo has been described as a lively attacker with tremendous skills and excellent ball control. As far as I know, Njoh Edimo is primarily a striker, attacking midfielder or right-winger. According to http://www.footcameroon.com, Njoh Edimo was 17 years old in March 2012. In other words, Njoh Edimo is born in 1994 or early 1995. Apparently, the talented Njoh Edimo dreams of a move to French top club Olympique de Marseille. Njoh Edimo is still very young and inexperienced but from my point of view, he has already shown enough promise to be watched closely in the continuance. The picture was found on http://www.footcameroon.com.